Could it be that the electric car has finally come of age? 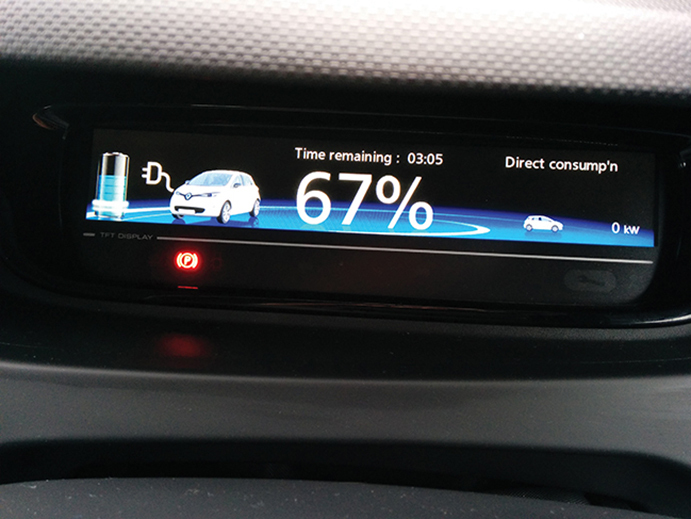 Stepping into the new Renault Zoe Z.E. 40 I would be inclined to argue it has. In some respects, this unassuming little car might seem like an underwhelming choice to back up that claim. After all, it takes more than four times as long to crack the 0-to-60mph sprint as the Tesla Model X we featured last month. If you look at what‘s kept drivers from going electric in the past, though, the Zoe now ticks an awful lot of boxes. 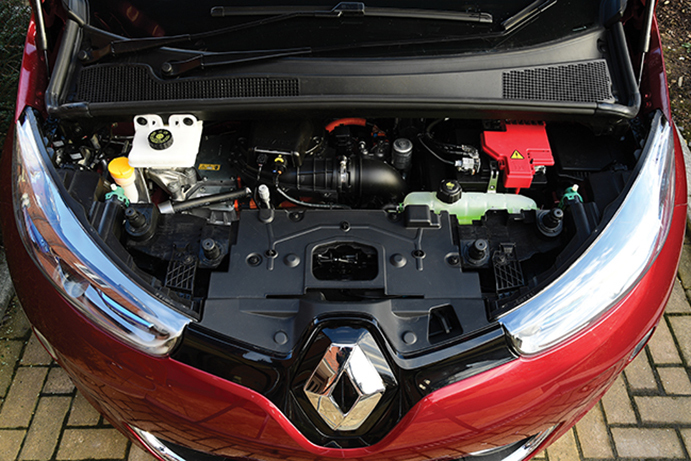 Renault has virtually doubled its range with the launch of this new 41kWh version, which is good for 250 miles on the NEDC test cycle. That’s said to equate to around 186 miles of real-world driving in good conditions – nearly 20 times the length of the average British commute. This extended range has been achieved without changing the physical dimensions of the battery and with only a 15kg weight increase. It still contains 192 cells arranged in 12 modules, but battery developer LG Chem has managed to pack more active materials into each one. Meanwhile, the surface area of the electrodes has been increased by some 10 per cent and a new cooling system aims to ensure more consistent performance across the temperature range. The next obstacle has traditionally been cost, but while the Zoe is somewhat pricier than a conventional supermini it’s an order of magnitude cheaper than offerings from companies such as Tesla. Starting at £23,445 (including the government’s Plug-in Car Grant) the 41kWh version is comparable to a well-specified Ford Focus. That said, over 90 per cent of buyers choose to lease the battery separately (priced at between £59 and £110 a month, depending on the mileage), which drops the purchase price to £17,845. 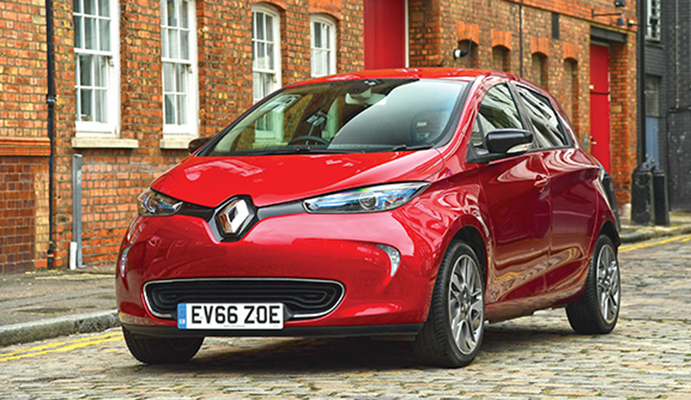 Opt for the entry-level 22kWh version and that figure falls to just £13,995. Finally, the Zoe comes with a clever onboard charging system, dubbed the Chameleon. This means it can draw the maximum power from virtually any charging point, including the 43kW fast chargers that are increasingly found in motorway service stations. As a result, the Q90 version – more on that in a minute – can fill 80 per cent of its battery in just over an hour. Renault even includes a fully installed 7kW Chargemaster home-charging system with each car. Of course, this would all be a bit redundant if the Zoe was rubbish to drive – but it’s not. The first thing you notice is the lack of noise and vibration as you pull away. Modern combustion engines have become so quiet that their noise often gets lost within the other sounds in the cabin. But take that engine noise away and it suddenly becomes apparent how much it does contribute. Listen carefully in the Zoe and there’s the occasional whir of the cooling system and a faint whine from the motors, but that’s about it. Even the wind and road noise is well suppressed by small-car standards. This particular Zoe has the R90 motor; so named because it’s the rapid-charge variant and its total output is around 90hp (92 to be precise). It’s a DC-excited synchronous unit developed Continental, which uses copper coils in the stator and rotor, instead of rare earth metals. As a result, it can be used either as a motor, a generator or a transformer. The Q90 has slightly different windings, which reduces the outright efficiency of the motor – knocking a few horsepower from the peak power figure and around 20 miles off the range – but allowing it to charge significantly faster on a 43kW supply. Somewhat counter-intuitively, this actually makes the short-range Q90 the recommended option for motorway use. Both versions produce 220Nm of torque from just 250rpm, which means they’re more than up to the job of hauling the Zoe’s 1,480kg mass. Unlike a combustion engine the torque is there as soon as you touch the accelerator, which makes it feel significantly quicker than the 13.5 second 0-to-62mph time would imply. Overall, the performance is very similar to that of a traditional supermini. And the same could be said about other aspects of the Zoe. Thanks to its low centre of gravity it handles neatly (albeit with fairly modest outright grip due to the low rolling resistance tyres). Packaging the batteries under the floor of the passenger compartment also means the boot is larger than average for a car of this size. Most drivers wouldn’t find that it demands any significant compromise compared to a combustion-engined car. The reduced running costs – potentially more than £100 less for every 1,000 miles travelled – would soon start to offset a higher purchase price. Electric cars, it seems, have reached the mainstream. I travel 187 miles each way from home to our main warehouse in my electric car and have a 10-15min stop on-route. Not because I have to, but because I want to keep the battery above 20% discharge. Give one of the new electric cars a test drive, I think you’ll be surprised. Hi Stephen, can I ask you what kind of EV you are using? Sounds like I may need to upgrade! I’m driving a Tesla model S75D, rated range 240miles, real world 200. But I don’t charge over 90% or less than 20%. What mileage would you get when operating either an air condition in summer or heating in winter? About 30% off in sub-zero temperatures – or so I gather from a i3 owner. Summer will be less of a problem. Hi Alex, that would be total battery range, which in the Tesla is more like 15-20%. Maybe a factor depending on cell type and ability to get the battery to the correct operating temperature. In both the Tesla and i3, the air-con going from off to full power reduces range by 2-3miles, and this was in Derbyshire on a freezing morning in January. It’s a cold winters evening and multiple electric vehicles are on a motorway. An incident occurs resulting in all vehicles being stuck. The electric cars run out of power so the heating fails putting the driver & passengers at risk. Then there’s the secondary problem of recovering multiple incapacitated electric cars prior to re-opening the motorway. Air-con does not take more than a couple miles range, even if stuck for several hours there is no danger of running out of power unless you were virtually empty. Given that EV drivers typically keep the battery at least 20% full in order to reduce recharge times, this would equate to over a day sat in my Tesla with the heating (seats and aircon) before any issue would arise. Even in the BMW i3, you would still be talking double digit hours. You need to take an EV for a test drive. I’ve had my Zoe for a couple of months now and when at a standstill it hardly uses any power – even with the heating on. There is common confusion that reduced range in cold weather is due to cabin heating. Whilst it is of course quite true that the cabin heater draws power, this is quite small compared with the loss in efficiency of the battery due to higher internal resistance at cold temps. This is worse for cars without thermal management as they can direct waste heat from motor and inverter to warm the battery (Tesla “range mode”). So when people state reduced range in cold weather, it is normally due to battery inefficiency more than heater draw. In stationary traffic there is far less energy being drawn as only the heater is running and no motor energy. So this inefficiency is far less of an issue. A fleet of EVs stuck stationary for 8 hours would still run afterwards (having lost maybe 32 miles range). For most people that would normally just eat into the comfort buffer that they normally like to arrive home with. For some others, who were low on battery before the incident, they might end up waiting an hour or so at a queue at the next set of charge points 🙂 If the incident involve a wait over 8 hours then normally the emergency services manage to open up a “double back” route so that everyone can evacuate that road. Time for the coat, gloves and scarf technology. It has kept humanity warm for centuries. Great to see battery development continuing apace. The battery rental seems like a good idea at first glance, but according to my rough estimates amounts to 12 p / ml. Then there is electricity purchase at about £ 5.00 / battery charge, (even before governments start taxing this): i.e. 3 p/ml say. Thus the car costs at least 15p/ml to fuel. My diesel operates at 9 p / ml and can take me 550 mls between fills, so I’ll stick with that until bigger improvements are made. How does it compare to buying the battery? The 41KWh battery costs £5.5K, and should be good for 5,000 charges at an average of 100 miles = 500,000 miles. OK, scrub that, the battery will last as long as the car. Call it 100,000 miles that’s 5.5p/mile – less if you get more miles out of the battery, though you might want to add financing. On E7 the electricity is about 1.5p per mile. Servicing costs should be a lot lower on the electric car. Of course, depreciation is the major cost, and it seems EVs suffer heavy depreciation. The flip side is that makes then excellent value second hand, but then you’re not getting the latest product. That sounds a bit like computers. I really like the idea of going electric (at least for one car), and the recharging headline cost does look very attractive. However once you factor in upfront car cost (no established used market, or used market knowledge), depreciation and battery costs I think the average man in the street will find it hard to justify for some time. I accept the electric car is possibly the future, for the next couple of generations at least. The case of the motorway with electric cars running out of charge for heating could be resolved by lane charging beneath the motorway, similar to wifi phone chargers. Battery charging times will fall as will distance between charging increase all clever stuff but within the grasp of the engineers. Last issue of resale values etc. not long ago it was muted that an electric car might be forever, change the seats, console occasionally but keep the shell? OK respray it if you get fed up with the colour (next step cameleon cars!) Doubt I will be around to see it but within the realms of possibility, remember we can achieve whatever our imagination is limited to. say your average electric car in the future has 30 kWh storage capacity; say 20 million cars. That 600GWh of national storage capacity; wow. Look at it the other way suppose 20 million car plug in and draw power off the grid once they get home at night…..say 6 hrs to charge a 30 kWh battery….so thats 5kW per hour. by 20 million cars; 100GW is needed every hour……slight problem….the uk doesn’t have 100GW. 50 maybe. So slight cockup on the supply side……as ever. Average car of the future will have 30kWh! most are at or over that now. Look at the new Zoe, i3 and Leaf, let alone the Tesla 100kWh. Charging demand could be an issue, hence Nissan looking at options to feed power from the car into the battery during peak demand and the current Western Power Dist. Electric Nation study looking at controlling domestic chargers to reduce peak loads. The best solution seems to be battery storage for renewables to assist with peak demand. Not possible I hear you all say, despite Germany on several occasions last year generating 100% demand from renewables. Also look at the work in Southern Australia were storage of daytime solar is being added to solve their evening power shortages. Not arguing that renewables will fully replace conventional power generation, but a lot of the initial issues are being tackled and solved. You could consider the same scenario for internal combustion vehicles. What would happen if 20 million cars, each with a 50l fuel tank, filled up at the same time. That’s a billion litres of fuel, the nation will come to a standstill overnight! I agree there are challenges to overcome, but there aren’t 20 million EVS on the road just now, in the same way there weren’t 20million ICE vehicles in the road in 1900. We adapted. EVs need to be charged at night. The power surge you talk of is identical to the teatime peak. The grid simply needs to provide that peak twice a day. Once at 6pm for cookers, kettles and microwaves and again at midnight for cars drawing about the same power as your oven. I have done the calculations and graphs etc. Key to remember that most EVs will not be empty most nights. I’m in agreement with Jack; my diesel is cheaper per mile than the EV. I notice with many articles on this subject, that the pollution at the generating station is not factored in; all green credentials seem to be based on tail-pipe emissions? Whilst this would keep the air in densely trafficked urban areas a lot cleaner, how does generation of electricity for charging compare with production of petrol and diesel fuel for pollution? I would like to see a report that includes all emissions involved with running a car, not just the creation of the ‘fuel’ but construction and disposal of the car as well – is there such a report? I’m sure Google will find such reports, but in general, a Nissan LEAF in the UK will emit about 80g/km at the power station. 80g/km is on a par with the best diesels – though that doesn’t factor in diesel refining and transport. (And also the local pollution of the diesel). The emissions intensity can be reduced by charging at night, when the grid is more nuclear, or waiting for more nuclear plants to be built. Or move to France, where your EV will emit about 10g/km. We would need about three Hinkley Cs to power every car in the UK on electricity. You need to consider CO2 emissions for oil based cars as that produced during extraction, transport, processing and final distribution. Most of which requires electricity generation to achieve. EV’s are less CO2 producing than oil cars, not just from the tail pipe, but also when considering the entire production process. One car manufacturer has a production facility 100% solar powered. Another is using hydro electricity to produce the carbon fibre shells. I pay 8p per kWh at night, incl Vat, and charge for free at many places. The best EVs do 5 miles per kWh. The worst do 2 miles per kWh. An electric car is an ideal 2nd car where the average commute to the shops and delivery of children to school is probably in the region of 20 miles a day – if you are scared about overloading the national grid, then try investing in a couple of solar panels and trickle feed the battery when the car is not in use (you may require an engineer to help you with this). I think you will find running costs drop to zero! The electric car is an improving technology and may be the long term answer to city traffic, like Boris’s bikes. However, at present the costs of ownership and usage do not look very good whether the battery is bought or leased it amounts to the largest part of the running cost. Perhaps CD hibernates in winter when his solar cells are worth little and the heater and lights are on.